Cracked Out Quiche Recipe - homemade quiche filled with cheddar, bacon and ranch. SOOO good! Can make ahead of time and freeze unbaked for a quick breakfast/dinner later. Some of the most popular recipes on the blog are my "crack" recipes - crack dip, crack potatoes, crack bread. I was trying to come up with a new quiche for dinner and decided to put all the crack flavors in it - cheddar, bacon and ranch. This quiche was SOOOO delicious! It was so cheesy and packed full of bacon. We almost ate the whole thing for dinner. I think this is our new favorite quiche. This was quick and easy to make. If you are short on time, you can make this the night before you want to bake it or you can make it and freeze it until you are ready to eat it. Place bacon in bottom of pie crust. Top with cheese. Whisk together eggs, milk, cream and Ranch dressing. Pour over bacon and cheese. Looks delicious, and SO simple to make. It would be lovely to take to a pick-nick. This looks scrumptious. I can't believe I've never made quiche before, especially since I love quiche! Nice recipe! i've made your crack potato recipe and it was DEElicious. This is a must try. I could enjoy this at any meal! this looks so good! Had to Pin! Do you think this would be just as good w/chopped mushrooms? I want to a quiche this w/o meat. Emily - I think mushrooms would be great. I love quiche...never thought about adding ranch as seasoning. It looks wonderful! Bleu Cheese dressing would a good swap for the Ranch dressing. I did use a frozen pie crust. I did not thaw it first. I just left it on the counter while I made the filling. Silly question, but do you use bacon bits (or cooked bacon)? I assume you do, but I want to make sure. Thanks! Carrie - I use a bag of Oscar Meyer bacon pieces. It is real cooked bacon, not the hard dried out bits. Mmmm! I think I'll make this for our dinner tonight! If you don't want to use the ranch dressing, you will need 1/2 cup sour cream. Do they sell deep dish pie crusts? I found the crust and made this tonight. While I loved the flavor, mine didn't come out just right. My crust was starting to get dark on top so I took it out. It was done, but it wasn't real "firm" it seemed like there was more cheese than there was egg. Also, the bottom of the crust was a bit soggy. Any suggestions? Sleepygizmo - you can try pre-baking the crust for a few minutes before adding the quiche mixture. Prick the crust with a fork and bake it for about 5-7 minutes. If the crust gets too dark while baking, cover the edges with foil or a pie crust shield. I didn't have the issue of it not being firm. Maybe try whisking the egg mixture with a hand-mixer - that will make sure they are whipped really good. Omg! This is awesome! Whole family loves it! Has anyone used a regular pie shell, as in... not a deep dish? I grabbed the wrong size and now I'm worried it'll explode/run all over the place. Haha. Lindsay - just fill it to the top of your pie shell and toss the rest of the egg mixture. Enjoy! I know this is an old post... but I am DEFINITELY making this, it will ring every bell. Question: I made one of your other quiche recipes recently, ham and cheese, I think, and the recipe used sour cream instead of heavy cream. I prebaked the shell just like the recipe said, and the filling baked up beautifully. However, when I cut the quiche, it 'wept' badly, as in tons of liquid in the bottom of the pan. It made it difficult/impossible to reheat what was left, as the bottom was so soggy. Any idea whether the "real thing" recipe using heavy cream would be likely to have the same problem? Do you think maybe I jinxed the recipe by using lowfat sour cream? Also -- since it's just my husband and me for dinner, does anybody know whether there are commercially-available small pie shells (like potpie size)? They would be ideal for dinner for two. Thanks for reading this longwinded post, and I really enjoy your blog. Instead of tossing the rest of the egg mixture if your crust is too shallow, bake it alongside in a sprayed casserole dish. Less carbs. It may be done before the crusted quiche, just test it. I use regular, frozen pie crust and it is really full, but doesn't run over! I make both of the quiche recipes on this site and have never had issues with them being runny. I do cook them a bit longer than she recommends though. Maybe it varies by oven. Made this yesterday for our Christmas day breakfast and it was excellent. I added some asparagus and everybody enjoyed it. Thanks Steph! Add it with the milk - I corrected the directions. Thanks! Can you just eliminate the crust? I don't mind using one but I don't have one on hand right now and I want to make it! Sure! I think that would be fine. Make sure to grease up the pie plate really good. I did it and it was great! Thank you soon much! To use as a freezer meal does this need to be cooked or raw when frozen? I usually freeze it unbaked and thaw then bake when ready. 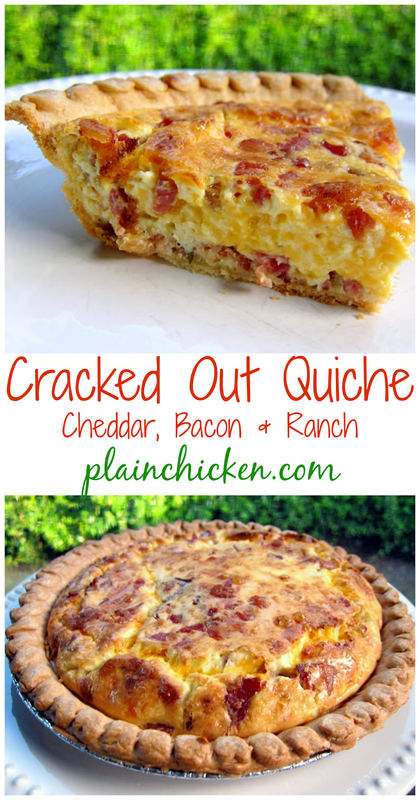 Love, love, love this quiche!!! Thank you so much for sharing!!! Hi, I just wanted to ask if it was important to use things like light ranch or 1/2% milk? Or is that just your recipe and it doesn't matter much? You can use the full fat versions. I don’t suggest no-fat versions though. Have a cheese question....Recipe calls for 1 Cup of Cheese. Grated cheese is now a 7 oz. bag. Do you use the whole bag or just fill a 1 C dry measuring cup???? Also, I cannot eat the packaged Bacon Bits. Do you have any idea how many slices of real bacon would be needed. Thanks so much for your help. One cup of cheese = 4 ounces. I used the precooked bacon pieces by Oscar Mayer. You can cook bacon and weigh out an equivalent amount. You could also buy precooked bacon slices and weigh those. I need to make a main breakfast dish for about 30 people!! This looks delicios and would work if I made about 4 of them. Do you think this work to make ahead and freeze or do you have another suggestion? I think that will be perfect. I freeze quiche all the time and it works great. Enjoy!